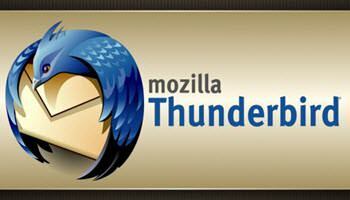 This is something I never knew Mozilla did until I started looking for an old eMail and could not find it. For some unknown reason, after a month or two my Inbox and Trash messages would disappear. It was either my wife deleting them, or a ghost. OK, maybe neither so it must be a setting that I did not realize was enabled. With some time and utter stubbornness I found out what was causing this problem. This is what is called a Retention Policy issue. Somehow, I set my account to delete old messages after 30 days. That does not work for this guy. Now I get to show all of you how to make sure that your messages don’t pack up and leave without a word of good-bye. I found two ways do to this: you can set this for the Entire Account, or do it for a Specific Folder. You can change any folder this way. This is great to be able to do with the Trash folder (I always seem to forget to empty it). Another perk is that it will not effect any of the other folders’ settings when you do it this way. Now you have more control over your eMail. 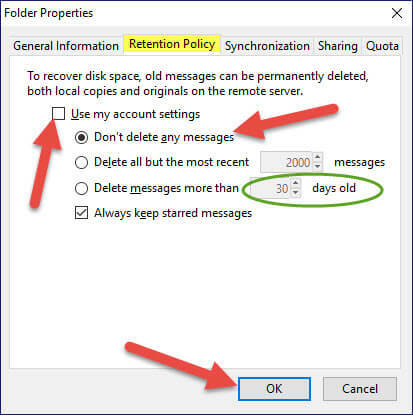 How long do you typically keep your messages? Jason, My Thunderbird (V45.5.0) appears to be different. 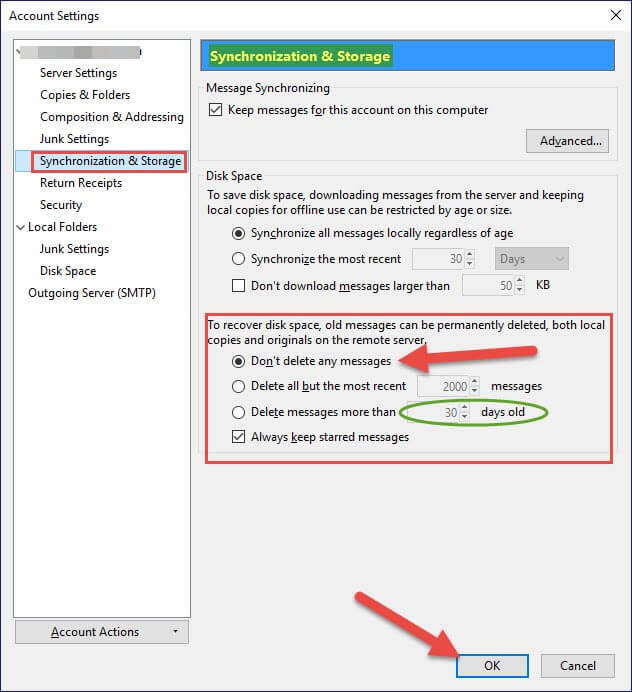 When I go to Tools > Account Settings, I do not get a “Synchronization & Storage” option for any accounts. All my accounts are “POP Mail Server” type. Would this make a difference? 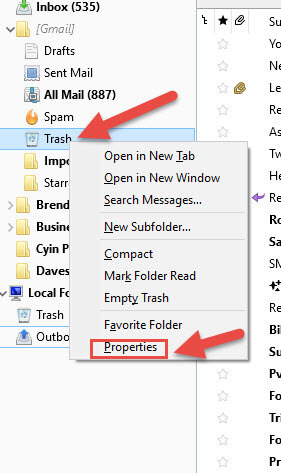 My “Trash” gets deleted when I exit Thunderbird. I have not noticed any other folders missing messages and some are years old. Love when someone asks a question that makes me think :). 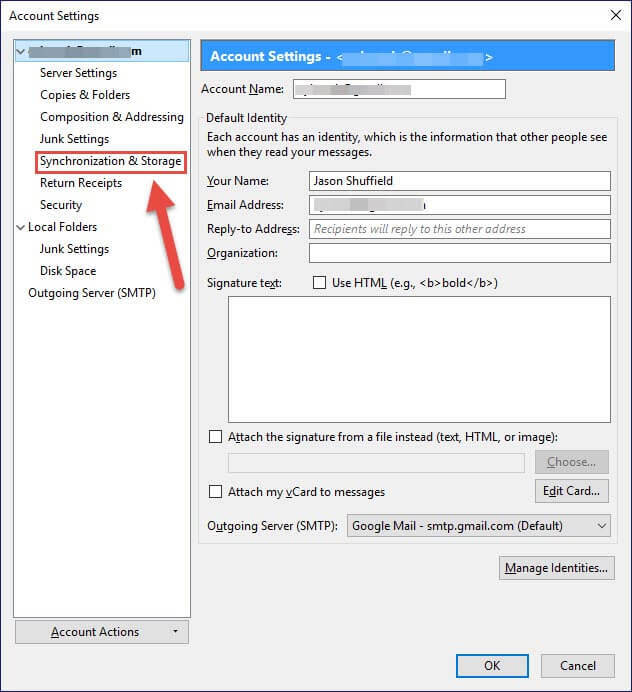 Yes it would make a difference if you are using POP mail server to an IMAP. IMAP gives you more functionality plus it is the most modern and widely used. POP is an earlier protocol with less functionality. All the accounts I tested this on where IMAP never thought about the POP servers so thanks for bringing it to my attention. You can switch from POP to IMAP as long as your mail provider supports it. If they do then switching should give you this function since I use the same Thunderbird version as you do. Of course that is if the function would be helpful to you. That is a good Idea to have the Trash empty every time you close Thunderbird. I still will stick with holding off for 30 days since I delete things and then a couple of days later need it back. 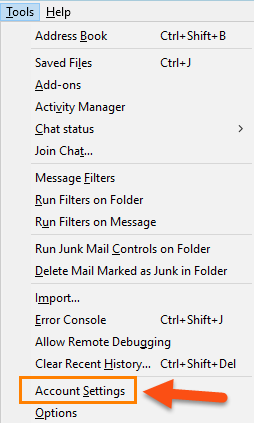 I’ve always found the ‘delete mail’ settings under ‘Local Folders > Disk space.